A word cloud with meaningful spatial properties. 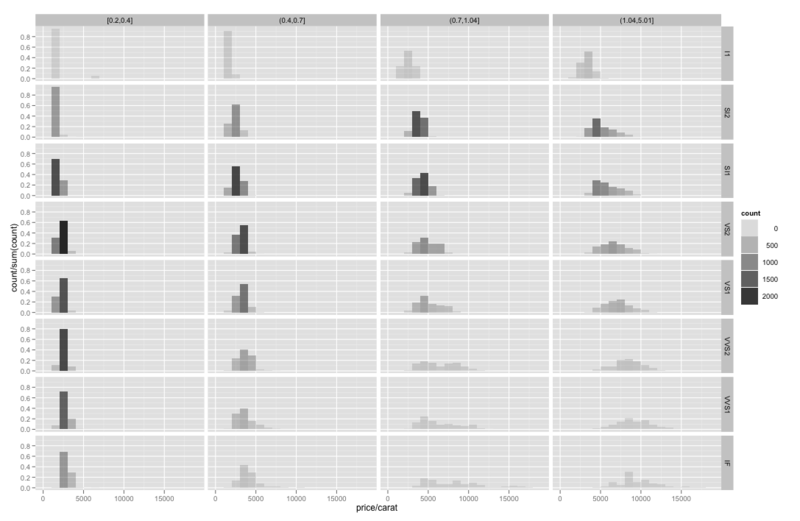 Ok so I have now done two iterations on a better way to visualize term frequencies using R, ggplot2 and plyr. The first was ok but ugly, the second was better but still ugly. 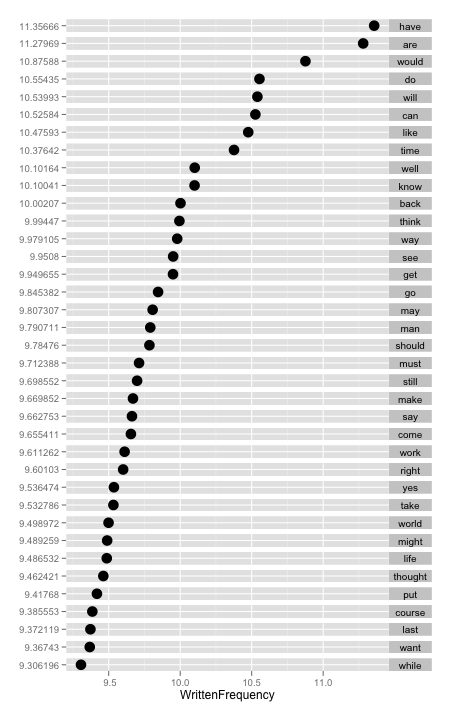 Words with similar frequency are in approximately alphabetical order from left to right. This one is now good enough that I will start using it in my own presentations and announce my retirement from the prestigious and highly-paid world of word-cloud improvement! This is an attempt to make word clouds more quantitative. It still needs more work in order to be an aesthetic competitor to the classic word cloud. Here is an alternative to word clouds that makes it easier to get insights, but also has some of the aesthetic appeal of the traditional word cloud. My first attempt at this looked pretty bad and this is not too much better, but hopefully someone else will help improve it. Someone recently asked on twitter about about peoples' preferences for cloud generators in R.
I replied that I thought the "null" word cloud generator was best. By this I mean that I think the word cloud is a bad visualization method. Why? Here is one article with a good perspective, but you can search for examples and see what insights you can get from word clouds; I think they usually obscure the insights. If you are trying to understand raw text then you really want to do better text mining rather than just word frequencies. 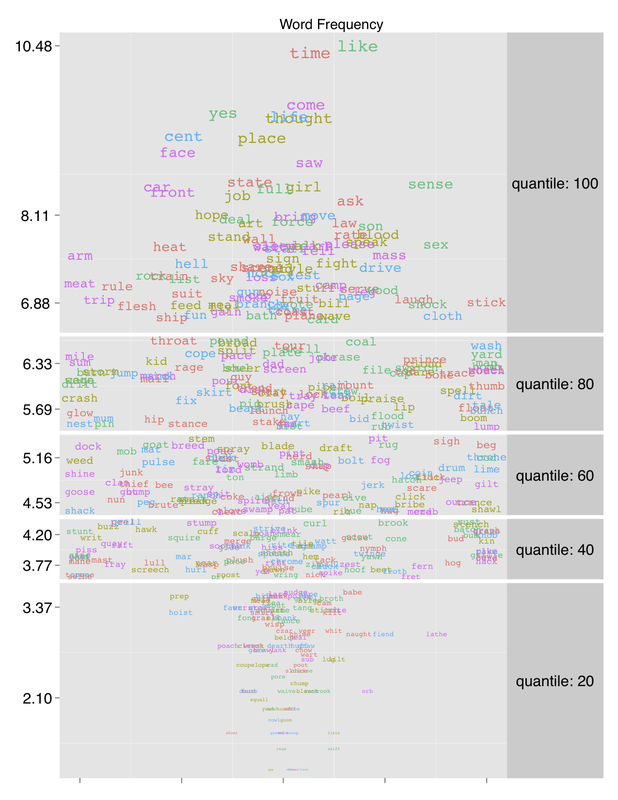 And if you want to just look at term frequencies, the word cloud is a very fuzzy way to go about it. 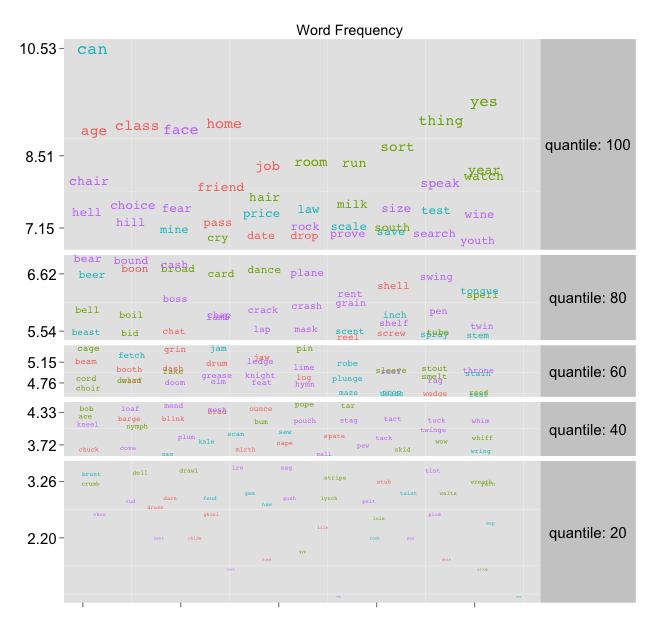 So the natural followup question is how to plot phrase/word frequency data. Here is an example of the kind of thing that I usually do. This is only for raw term frequency data (you will need to tabulate it yourself first, which is easy). For real text mining analysis you can always use packages from the CRAN Task View. There are lots of things you can do to make it fancier and prettier. Does anyone have something better? Selecting subsets of a data.frame is easy in R if you define the predicates manually. all of the rows that match any of the predicates. The key is using outer to match against many predicates and then checking that any of them was satisfied. …but I would argue that you should also be able to start with a bare machine (or cluster) and bootstrap a scalable infrastructure for analysis in short order. This does not mean you need to be able to administer a 1000-node hadoop cluster, but you should be able to set up a small cluster that can process TBs of log data into something that has business value. For people who work for a big company it is easy to fall into the habit of using whatever infrastructure is available. Your IT department may have set up a hadoop cluster, there may be databases that are pre-configured and there are probably a lot of nice productivity tools that make it easier to analyze data at work. It makes perfect sense for companies to provide these conveniences and it probably makes your job easier. But it is also easy to get too cozy with this tool chain and come to rely on it. In this series of posts I am going to talk about the analysis stack on my personal computers that help me do those things. It took me a while to get this set up but I have a goal of being able to start from scratch and install a complete working data science setup in 6 hours or less. The Tea Party, Occupy Wallstreet and many other movements (that are not about human rights) share the same problems. In order to gain a big following they have to have very, very simple ideas at their core. Charles Stross wrote a nice blog post about a totally different topic but I am going to shamelessly quote out of context. Governing gets harder as the world gets more complex because our ability and desire to understand complexity is not growing exponentially. This is an illustration of representing point count in a graphic using transparency. This is easy to do in ggplot2 if you use one of the barchart type of geoms. However I think there are other situations where it would be useful to apply aesthetics based on point count. Since Hadley did a lot of his canonical examples using this data I thought it would be helpful for comparing and contrasting. This chart shows the distribution of the price/carat of diamonds segmented by quartile of carats and clarity. The transparency shows how many diamonds each bar represents. This makes it easy to see where the action is. 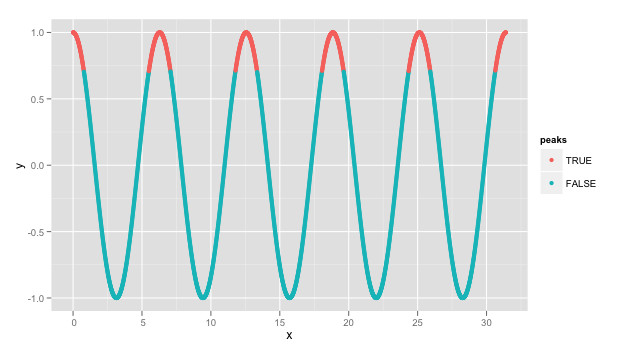 Currently in ggplot2 this method will only work if the ..output.. variables related to count are available. There are a number of areas that could benefit from this capability. 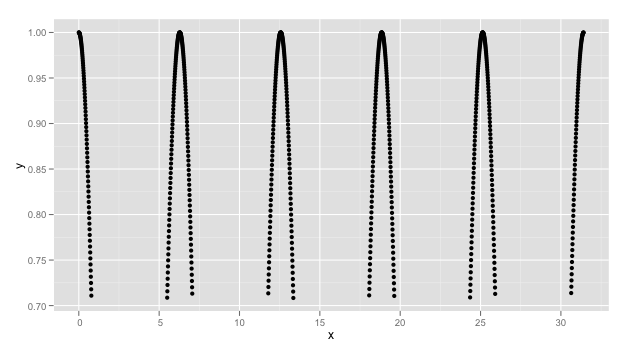 It should also be easy to add more output variables to the elements of ggplot for which this behavior would be natural. facet_*: It would be interesting to be able to add a visual cue to each facet to show how many points are in each. The most appealing idea on this so far is to enable scaling of the facet area by point count (or other things). Ordering of the facets by point count would also be extremely useful. Thresholding by count. This would be great to easily chop low-signal facets and keep the visualization clean.